Doll Sale - Richard Simmons, Creation of the Masters Artist Doll Sale! Richard Simmons-Collection of the Masters! This is Jessica, and includes her flower baby AND also her tuffet! Jessica's shoes and sox are sculpted and hand painted with decorations on her shoes! 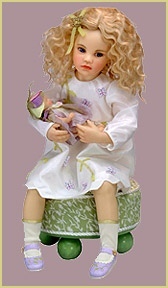 New from the Premier Introduction Collection of 2001, she has only been removed from the box for quality inspection. ALL PHOTOS COPYRIGHT MANN GALLERY. ANY UNAUTHORIZED USAGE WILL REQUIRE PAYMENT OF A FEE! Certificate of Authenticity also included. In luminous lifelike translucent resin. 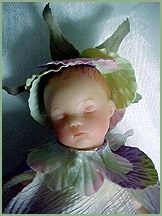 Handpainted, she wears a beautifully crafted, satiny dress with butterfly and ribbon leaf trim, and she is has her own little dressed flower doll. Jessica also wears a little buterfly ornament on her ribbon in her hair. She is approximately 6 pounds shipping weight BEFORE packing and a total of about 8 pounds to ship. Buyer to pay all shipping costs. Do Form to send us E-Mail!